Even as the news of the South-West Monsoon reaching the Andaman Islands flows around, here is one book that I read some years ago about the monsoon, its significance and the sheer joy and miracle of rainfall. 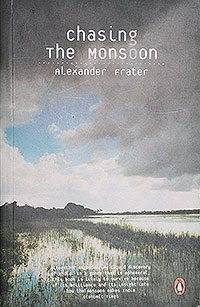 A lovely non-fiction account by Alexander Frater, the author follows the monsoon as it first arrives in India at Kerala and then follows it in one exciting journey to the 'world's wettest place' - Cherapunji, in north-east India. An ideal read as we await the monsoon.